I don’t know if I practiced more than anybody, but I sure practiced enough. I still wonder if somebody – somewhere – was practicing more than me. 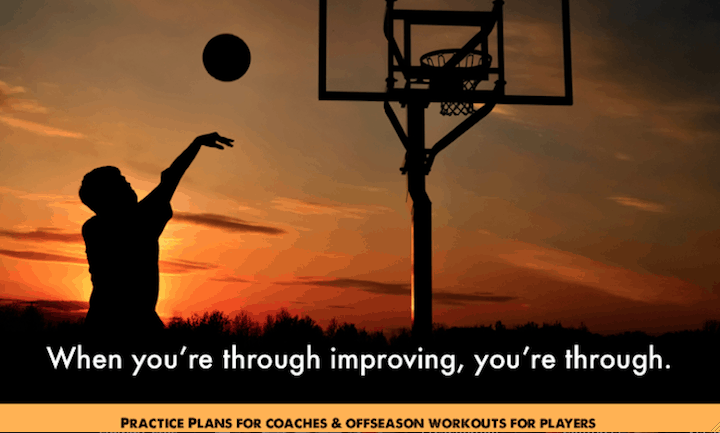 I’m a firm believer in that you play the way you practice. It doesn’t matter who scores the points, it’s who can get the ball to the scorer. Once you are labeled “the best” you want to stay up there, and you can’t do it by loafing around. If I don’t keep changing, I’m history. I always know what’s happening on the court. I see a situation occur, and I respond. I’ve got a theory that if you give 100% all of the time, somehow things will work out in the end. You can make all the excuses you want, but if you’re not mentally tough and you’re not prepared to play every night, you’re not going to win. Tip: Coaches – use these Larry Bird quotes in team communications. I wasn’t real quick, and I wasn’t real strong. Some guys will just take off and it’s like, whoa. So I beat them with my mind and my fundamentals. I really don’t like talking about money. All I can say is that the Good Lord must have wanted me to have it. Leadership is getting players to believe in you. If you tell a teammate you’re ready to play as tough as you’re able to, you’d better go out there and do it. Players will see right through a phony. And they can tell when you’re not giving it all you’ve got. Leadership is diving for a loose ball, getting the crowd involved, getting other players involved. It’s being able to take it as well as dish it out. That’s the only way you’re going to get respect from the players.